In a time where loud seems to be the only way to express one’s opinions, it has become a quiet pleasure of mine to revel in the subtleties of life. I’ve come to realise the nuances and appreciate smaller yet distinguishing features which, in my case, has led me to food that is effortlessly tasty. I have long been an admirer of Middle Eastern cuisine — having made a trip to Jordan (not southern Kowloon) in past years — and actually met a modern-day Bedouin, so I was delighted to learn that a new restaurant in Hong Kong would not only honour their indigenous traditions and nomadic way of life, but bring it to life for today’s urbanites. Developed by the same brother-sister duo, Alexis and Laura Offe of Brazilian-Japanese restaurant Uma Nota, the newly opened Bedu sits in the centre of Gough Street’s eclectic mélange of boutiques, art galleries, cafés and restaurants. 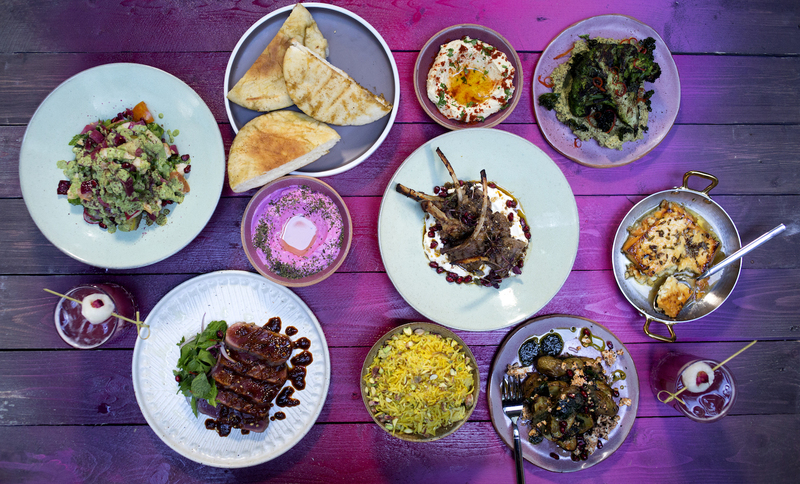 We went to see if this modern Middle Eastern restaurant could hold its own in the now decidedly cool area of NoHo. Commanding a corner off the Shin Hing Street staircase, one may have missed the side entrance of Bedu had it not been for the smiling street mural that beckoned not only us, but many passersby that stopped to feed their Instagram. Walking into the restaurant felt friendly and familiar, with a warm interior that features natural elements of wood and metal, brightened by a vibrant stroke of beetroot tones. The semi-open kitchen added a buzz to the relaxed atmosphere and the simple menus, designed by Chef Corey Riches with dishes to share, piqued our interest. We began our meal with a cocktail and I wash the work day away with a Bedu Sour. Made with beetroot, apple and lemon juice, Verjus, apple spirit and egg white — it’s pleasantly acidic and juicy, balanced by the earthiness from beetroot it is incredible easy to drink. So easy in fact that I ordered another drink before our other guests arrive. Having consulted our attentive and knowledgeable host, I opted for something a little stronger, and a Sayidi Martini hits the table and my alcohol tolerance. It packs a punch with fresh Capres, Cedrat (a Jerusalem citron) liquor, Tomato 72 liquor and vodka. The drinks list also offers varieties of natural wines from neighbourhood suppliers, but sufficiently jubilant, I decided to save the wines for another potential visit. A selection of starters were brought to the table to welcome us; a fuchsia-coloured Beetroot and Mint Labneh that we soak up with a warm serving of Homemade flatbread and crunchy Homemade pickles. The pickled chillies were a tad too salty for me. Thankfully, the vinegary cauliflower, carrots and radish adequately whet the appetite. Some smaller plates are offered shortly after and the classics have been given a makeover that we gladly receive, including Golden spiced chicken manti, a typical Turkish dumpling usually made with lamb, which is stuffed with chicken instead. Completed with yoghurt, almond flakes and a subtle heat from the flecks of Aleppo chilli oil, the dish is an easy win for our dumpling-loving city. Nevertheless, it nods enthusiastically to its Middle Eastern roots with a bold use of aromatic spices. As I looked through the menu for our mains, it becomes apparent that many of the dishes are either vegetarian, gluten-free or both, which bodes well for modern dietary requirements. Still, on a table full of carnivores, we are more than happy to sink our teeth into the perfectly cooked Rack of lamb with garlic labneh and za’atar oil and did not expect too much from the Charred broccoli dish, which is cut in half with florets still attached. Upon tasting, I am taken aback by the flavour of this unpopular vegetable. Smoky from charring and seasoned with crispy kale, chilli and zhoug (a spicy green chilli sauce) we devour the broccoli and continue to mop up the zhoug with our remaining flatbread. Dinner is finished with dessert and there are intriguing options to choose from, though you could easily order all three to share, just as we did. Likely favourites include the Watermelon, almonds and mint sorbet which is a necessary refresher for Hong Kong’s most humid days, but the sweet hero of the night was the Set yoghurt with orange blossom and honeycomb. The slightly floral and sweet yoghurt is fragranced with vanilla before it’s set and topped with honeycomb that is taken to the very edge of bitterness before it’s burnt, adding maltiness and texture to the dish. A glass of mint tea ends the evening and I go home in my taxi thinking about the way good food, accompanied by good company, doesn’t need drama or theatrics and instead sings a song of simple satisfaction. Perfect for: a party of friends or catch ups in a relaxed and cosy atmosphere. Notes: Bookings are only available from Tuesday to Sunday at 6:00-7:30pm; the maximum number of guests for a la carte dining is six; groups of seven or more are offered a Chef’s menu for HK$370 per person and requires deposit.